In Ramadan, the doors of Paradise are opened; the door of Hell are locked; the devils are chained, and good deeds are made easy. In Ramadan, obligatory worship is increased in reward seventy-fold; voluntary worships is rewarded equal to what is given for the obligatory usually. In Ramadan is a night so precious it outshines an entire lifetime’s worship. Ramadan is a month of fasting. Fasting is an ancient act of worship given to us, and those before us, so that we can learn to become God-fearing individuals, and the best versions of ourselves. Ramadan is so special that it requires preparation to be ready for it, lest one miss out on the tremendous blessings it brings with it. 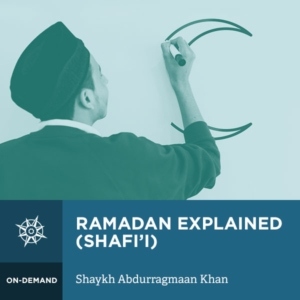 This course is essential to ensure one hits the ground runnings as soon as Ramadan begins, and that one does not lose momentum during its precious days and nights. This course covers the start of Ramadan, who must fast, the conditions of fasting, how to fast, tarawih prayers, and much more. This course is based on the Shafiʿi school of law.